Catering refers to a kind of business which provides food services at a remote site or a public location including hotels, public houses or pubs or any other location. It encompasses the task of professional food preparation which should be served to a group of individuals at a specific place for a designated fee and time. When in the past catering services are only viewed as services that can be provided to the wealthy, it is now in great demand for most occasions depending on a person’s budget. Catering actually has two major types. The first one is the on-premise catering which refers to the act of preparing and serving foods to a group of individuals in a similar location. The second type of catering is the off-premise catering which can be defined as the process of preparing foods in a kitchen and then transporting it into the place designated by the client where it will be served to a group of individuals. Transporting foods from one place to another is said to cause issues when it comes to food safety so a certified professional in the field of catering is required to learn about the basics of safely packing foods to keep them either hot or cold and prevent any spillage. This can actually be accomplished with the help of refrigerated vehicles, portable warming units and insulated coolers. To become a successful caterer, you have to continuously produce high quality and safe foods so you can continue winning the hearts of the public. If you dream of being part of the catering and food service industry, then you should know that enrolling in a catering certification program especially that which is offered by the most reputable online certification and skill testing company at present called Brainmeasures is the best thing that you can do. This online catering course offered by Brainmeasures is the road towards embracing all the essential aspects related to regularly providing hundreds of clients with the best catering services. With the kind of catering training that this certification course offers, you will no longer find it hard to understand all the issues that you may encounter when providing catering services to the public and the specific methods that you can use in dealing with each of them. You will understand all the solutions designed to continuously produce foods that are of the safest nature and satisfy your clients with the quality services offered by your staff. After you receive your catering certificate, you will become more confident as this serves as an indication that your skills and knowledge are already enough to become successful in the catering industry. 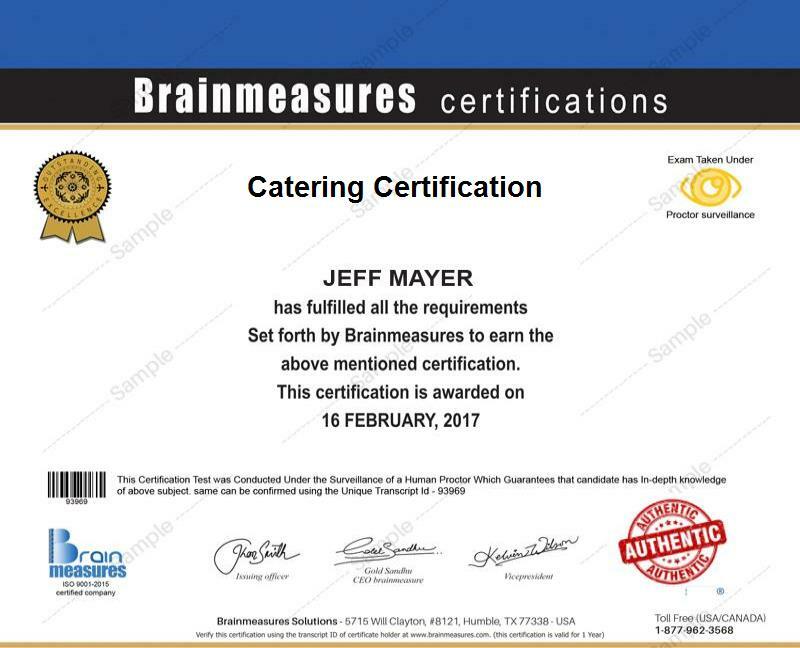 The catering certification program which is now available at Brainmeasures is a huge help for individuals who dream of improving their craft in the catering industry. It is most suitable for aspiring chefs and catering business managers who wish to hone their catering skills and understand everything related to the industry so they can continue to satisfy their clients with their top-notch services and high quality and safe food preparation. Working in the catering industry after your successful completion of your catering certification course is also amazing since this allows you to start earning big. Your catering certification can be used to work as a catering supervisor which allows you to receive a starting pay of $42,000 annually. You can also work as a catering director which will give you the opportunity to earn higher. As a catering director, you can expect your salary to be within the stable range of $48,000 to $88,000 annually.